"This dish was created in the Lazio region (the area around Rome) in the middle of the 20th century, after World War Two. We don't use cream, milk, garlic, onions or other strange ingredients; we use only guanciale, eggs, pecorino cheese, and lots of black pepper (carbonaro is the Italian for coal miner). This isn't the Italian-American version, it's the real, creamy carbonara and it comes right from Italy, where I live. Buon appetito." Heat olive oil in a large skillet over medium heat; add guanciale (see Cook's Note). Cook, turning occasionally, until evenly browned and crispy, 5 to 10 minutes. Remove from heat and drain on paper towels. Bring a large pot of salted water to a boil. Cook spaghetti in the boiling water, stirring occasionally until tender yet firm to the bite, about 9 minutes. Drain and return to the pot. Let cool, stirring occasionally, about 5 minutes. Whisk eggs, 5 tablespoons pecorino Romano cheese, and some black pepper in a bowl until smooth and creamy. Pour egg mixture over pasta, stirring quickly, until creamy and slightly cooled. Stir in guanciale. Top with remaining 5 tablespoons pecorino Romano cheese and more ground black pepper. Guanciale, dry-cured pork jowl, is available from specialty markets. Substitute unsmoked bacon or pancetta for the guanciale if desired. Use Italian pasta for best results. Substitute bucatini for the spaghetti if preferred. Substitute Parmesan cheese for the pecorino Romano if desired. Tip: ask somebody to hold the pot so you can stir pasta quickly while pouring the egg mixture over it. Did not care for this. Had a bitterness and off flavor. Not sure if the cheese or the pancetta. Probably both. So delicious and so easy! 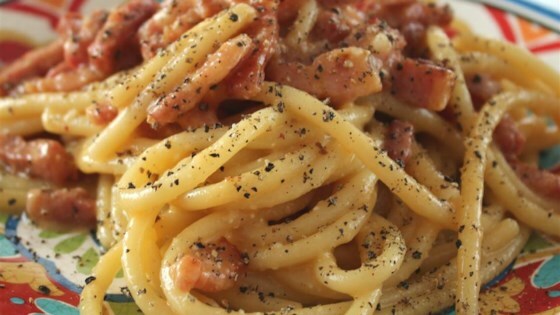 I’ve always been afraid of carbonara, but never again! Next time I’ll use less pancetta (maybe 1/2 — 3/4 lb). Just our preference. Great recipe! I used cubed ham slice that's what I had. Came out delicious. I'll be making this regularly with the ham since it is inexpensive and readily available.